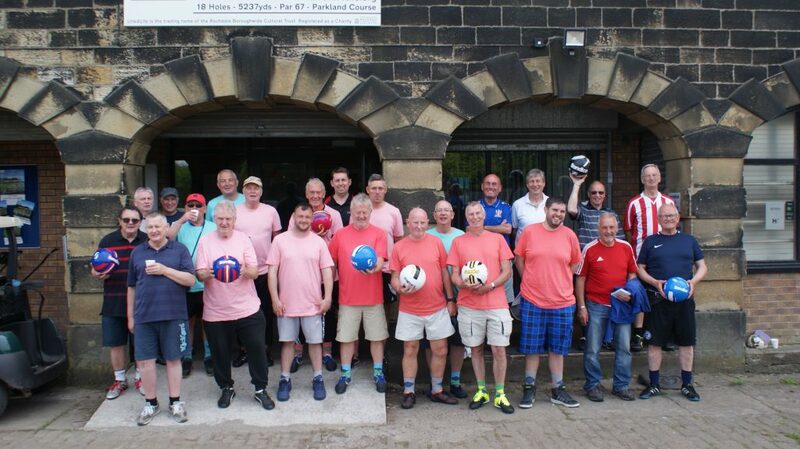 The GMWFL held a one day Footgolf Tournament at the Towneley Footgolf course in Burnley on Wednesday 18th July. The general opinion was that it was an interesting course and we will return. The winner with an amazing round of 59, 7 under par was Steve one of the Rochdale AFC coaches. Our very own Paul Gardner was runner up with a very creditable 63, 3 under par. Well done to both and all who attended. A few holes in one were recorded today. Steve graciously forfeited the first prize of a two week family holiday in Greece to the runner up Paul. A few Manchester Corinthians players took part and did well, Bill Charlton, Steve Colesby, Stuart Greaves, Val Mears and Kevin Williams. Thanks to Paul Gardner for organising the day and Steve our driver and winner. 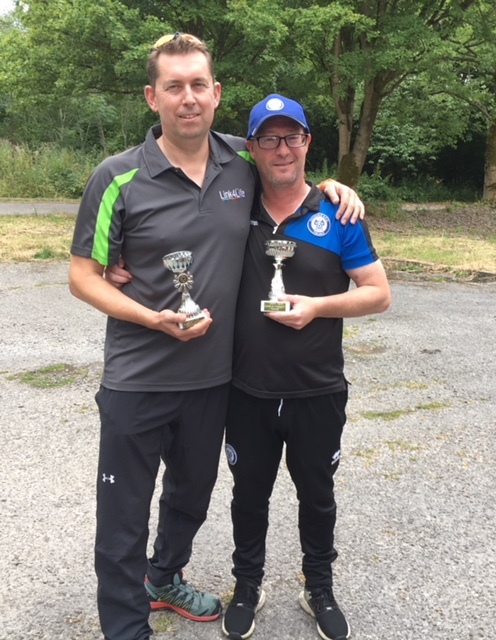 Burnley Footgolf Tournament Top Two. Left To Right: Paul Gardner runner up and Steve the winner. 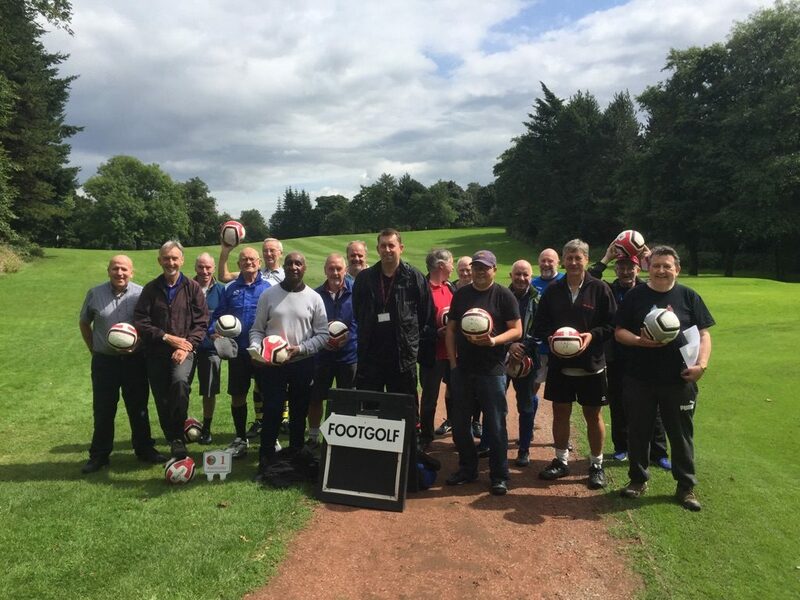 The final session of the GMWF 2018 Footgolf League took place on Friday 13th July. Rain delayed the start but the weather soon dried up for the eighteen players. The overall winner was Guy Hampson with a total of 242, an excellent score with some consistent rounds over the four months. In second place came last years winner Steve Colesby on 248. Third place went to Kevin Williams on 251. Over the four months there were some very low scores, first Mathew Williams with a 59, then Guy Hampson with a 58. I thought that would not be beaten but Kevin Williams shot a magnificent 55, 9 shots under par, a score that will remain unbeaten for a long time, or so you would think. Steve Colesby (2nd), Guy Hampson (1st), Kevin Williams (3rd & Lowest Round). Thanks to all who took part in the four sessions and to Paul Gardner for the photography, organising the venue and the refreshments. We hope you will all return for the 2019 tournament. 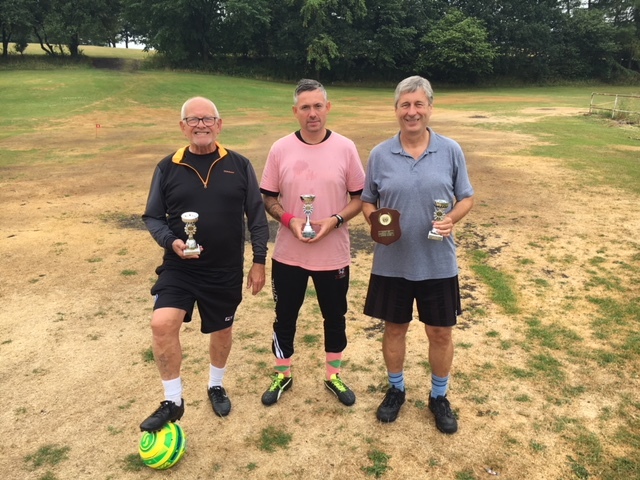 The third and penultimate session of the GMWF Footgolf League was played today, 15th June 2018 under cloudy conditions but thankfully the rain held off apart from a few drops now and again. The leader board from last month has changed dramatically with leader Stuart Greaves having a disastrous round of 69 to leave him in fourth position on a total of 192. Guy Hampson, two shots behind Stuart after the May session, had a remarkable round of 58, the current record for the lowest score on 18 holes. Guy is now the current leader, 5 shots clear of last years winner and currently second placed, Steve Colesby. Three shots behind Steve is Bill Charlton on 191, followed by the aforementioned Stuart Greaves on 192. Fifth placed Kevin Williams shot a 69 and agreed it had been a bad day’s Footgolf for himself. Everyone seemed to enjoy the session despite some poor scores and it’s still all to play for in the final session on 13th July. Our very own Paul Gardner has threatened to enter the mix, boasting of rounds of nine holes completed in 24, or was it 27 Paul? It will take some doing to overall leader Guy Hampson and the first prize reward of an all inclusive 14 day holiday in Bermuda for the winner and their partner. Steve Colesby looks to be in line for the second prize of a weeks caravan holiday in Rhyl and although Stuart Greaves had set his heart on the third prize of two weeks in the Rhyl caravan, that now looks to be a pipe dream. Today’s photographs have been added to the GALLERY below. Comments welcome. The second session of the GMWF 2018 Footgolf league was played in bright sunshine on Friday 18th May 2018. Twenty five footgolfers took part with some very low scores recorded. Top of the Leader Board after two sessions is Vintage Celtic’s Stuart Greaves with a score of 123. Closely behind Stuart is Third Space Senior’s Guy Hampson on 125. Three Rochdale AFC Strollers players are in third to fifth spot. Bill Charlton and Kevin Williams, last years joint runners up on 127, and last years winner Steve Colesby on 128. Five other players are in the one thirties but highly unlikely to catch the top five in the two session left to play in June and July. The best team score was Third Space Super Stars with a total of 253, the best team score to date. So it’s all to play for and promises to be a very tight finish to determine the winner of the GMWF 2018 Footgolf League. See Gallery at Bottom of page. Thanks to Barry Woodburn for his administrations and photography on the day. The GMWF Footgolf League started on Friday 13th April 2018. 7 teams competed on a dull cloudy day, fortunately the rain held off until all teams had completed the 18 holes. Lowest score was 16 year old Mathew Williams with a 59, which included a hole in one. Well done Mathew, you also beat the ‘old fella’. Winning team was ‘Still Breathing’ (Vintage Celtic), with a score of 257. 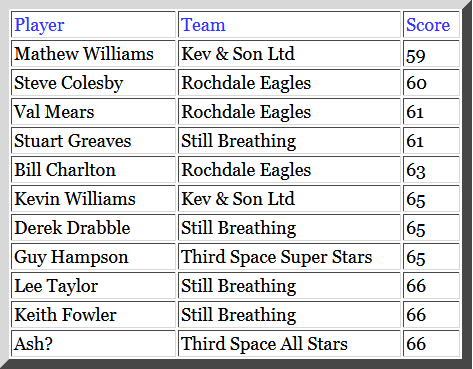 ‘Third Space All Stars’ had a 277, ‘Rochdale Eagles’ a 278, ‘Roach Dynamos Clubfoot’ a 282, ‘Third Space Super Stars’ a 287 and ‘Third Space Seniors’ a 309. The ‘Kev & Son’ team of 2 graciously declined to double their score, which would have put them in first spot with a 248. Many thanks to Paul Gardner for his excellent administration on the day and for the refreshments afterwards. See Gallery at Bottom of page. The Footgolfers Line Up For The Start 13.04.18. The inaugural Footgolf league starting on 13th April 2018, will have the following teams involved – ‘Blue Celts’, ‘Blue Vints’, ‘Club Foot’, ‘Rochdale AFC Eagles’, ‘Third Space Seniors’, ‘Third Space Superstars’ and ‘Third Space Wanderers’. 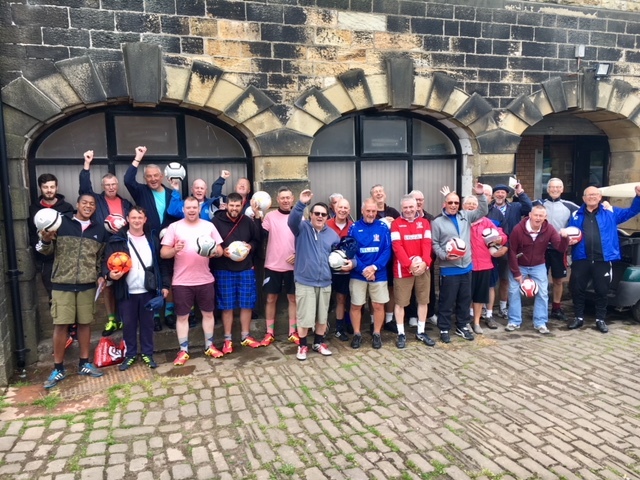 The Greater Manchester Walking Football League in conjunction with Link4Life have decided to form a Footgolf League for teams that play in our walking football programmes. 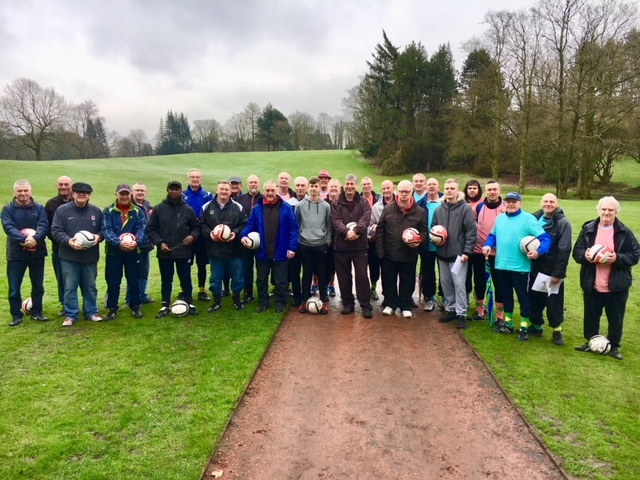 We had an inaugural one day Rochdale Footgolf Open competition in August 2017 which was a huge success and which made the decision to start a Footgolf League an easy one. See poster below for details. Another thoroughly enjoyable day out, well done to everyone who organised and took part! Thanks for the kind words Bill, and for all of your efforts in organising this great event – also to Paul and Barry who help to make it such an enjoyable time. No idea how I managed that score; somebody will beat it one day but I bet it isn’t me. I have had my good luck for a few hundred years after that LOL. Another fun day out despite my playing as though I had my shoelaces tied together. A special mention for our playing partner Ian who took 7 shots OFF his 18 hole score to record his best ever! Thanks again Bill and Paul, looking forward to the last round already. Great sport this and absolutely funny but serious, it’s impossible to miss the hole you would think until you try it. Great day out and afterwards sausage rolls which are delicious even without brown sauce or mustard. Colin still breathing at 75. This is a great event, played in a great spirit, which as we have seen recently is just as important as any other aspect of the game. Thanks a lot to all of the guys who organise and take part!